Although it is great to learn she’s enjoying the collaboration and we’re quite happy that she delivered a message to Alexandrakis for the fans to read (she, who usually doesn’t give much news while in studios as she’s not too much into the internet tools), we can’t help but notice that she still sounds haunted by her old demons, alluding to people’s judgement, and the disappointment of being let down. Let’s hope songwriting, as well as this break post The Voice will help her achieve some closure. 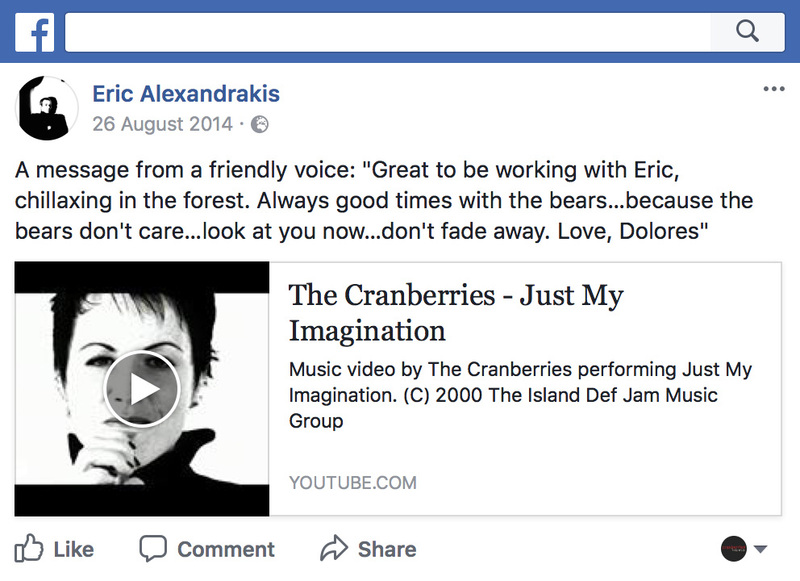 As often these last weeks, news about Dolores come from the composer/musician Eric Alexandrakis who informs us on his Facebook that Dolores should record some vocals tomorrow on an “Electrons” track he wrote called “La Fine”. “Electrons” probably is the name of the project or band (?) Good news. 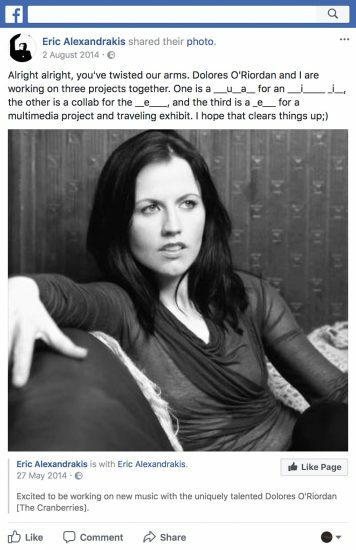 @DolORiordan vox going down tomorrow on an Electrons track I wrote called “La Fine”. It’s going to be fantastico, e molto impressionante. 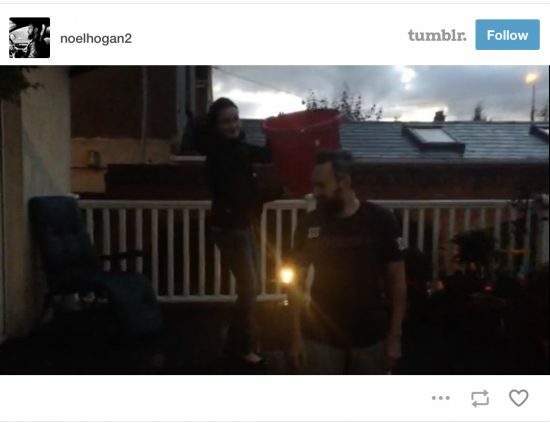 This time it is Mike Hogan’s turn to appear on an “Ice Bucket Challenge” video. It was posted yesterday on The Sage Café’s Facebook. Mike is one of the guys pouring the buckets of ice water on others (hey, he is the boss after all)… and seems to enjoy it. Sage cafe ice bucket challenge.#ALS.We nominate Savoy hotel,Red Hen bar and Cornstore. Funny indeed, but this video is not the direct response to Noel challenging him. So we might have another video with Mike very soon (or not!) and this time he might not enjoy it as much as he just did. Stay tuned. This summer if you’re living on the same planet as us, you probably noticed tons of videos of celebrities or friends pouring a bucket of ice water on their head. This is called the ‘Ice Bucket Challenge” and Noel just agreed to do it and posted the video on his Tumblr. Have a look his video is quite funny… especially the way his family reacts. 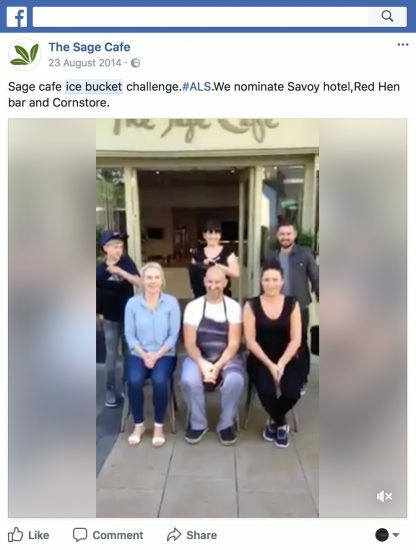 The Ice Bucket Challenge spread over the internet these last months and kept growing and growing this summer. It all started from an athlete suffering from a degenerative disease combined with a good dose of self-deprecating media from the celebrities. Bill Gates even did it! The principle is based on having more and more videos all over medias/internet of people doing it to get funds for the ALS association. ALS is for amyotrophic lateral sclerosis. Those who are nominated have 24 hours to do it and can challenge 3 people of their choice to do the same. If they don’t accept they have to donate $100 to the association. It appears that most of celebrities are doing both. On this day ALS raised more than 60 million dollars. So who’s gonna challenge Dolores? Noel didn’t… Mike maybe! Even if there is not much chances that Dolores will do it as she tends to avoid the Internet and everything that revolves around it, it may reach her one way or another. Mike may nominate Russell, Russell may nominate Don and Don… well, we’ll see! Good cause and good fun. Noel Hogan has been working hard for the city of Limerick this year with different musical projects like “The Pigtown Fling” album & concert as well as “The Music Bus”. Now it is Dolores’ turn to do something…again! 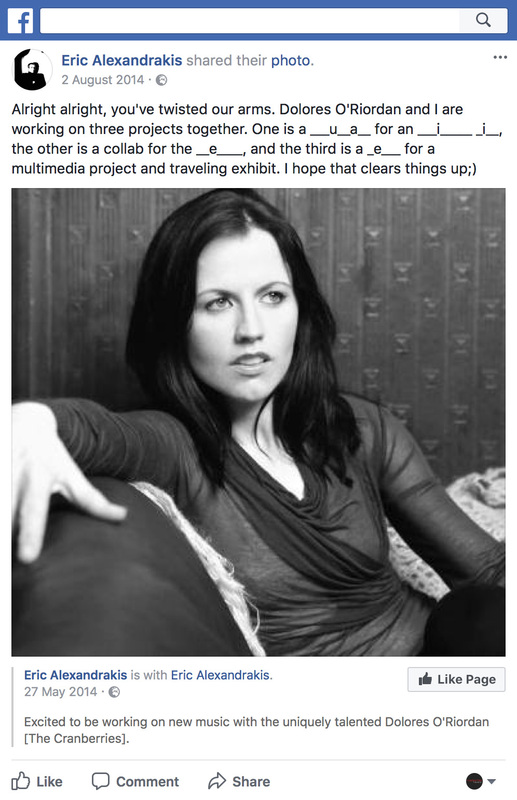 After playing live with the Irish Chamber Orchestra for the grand opening concert on New Year’s Eve, a new article entitled “Dolores O’Riordan adds to Limerick’s Limericks walking tour” published by Hot Press today informs us that she recently joined the list of celebrities who have written a “Limerick writing”. Anyone can participate, not only celebrities! Apparently the contest, because it appears to be a contest, already received a huge volume of entries. Winners will be featured on the upcoming virtual walking tour of the city. So if you think you have something to say about Limerick and would like to join in, you can still send your words until August 25th. Dolores probably already won (or more probably she is out of competition) and will be featured. 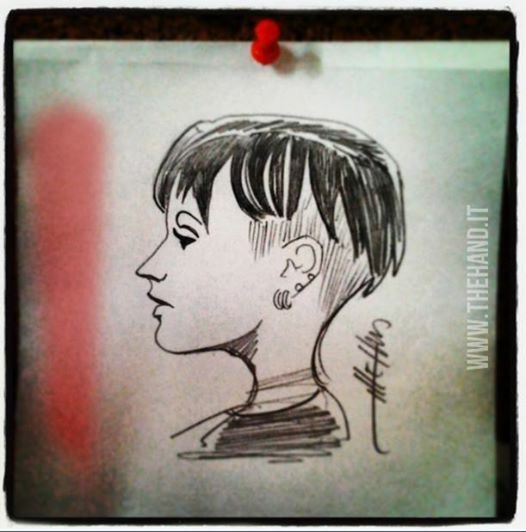 This first drawing clearly is inspired by Dolores’ last look on “The Voice of Ireland” TV show, a very 1993 look with hair partially shaved and rings on the ears. This one was published today, August 13th. 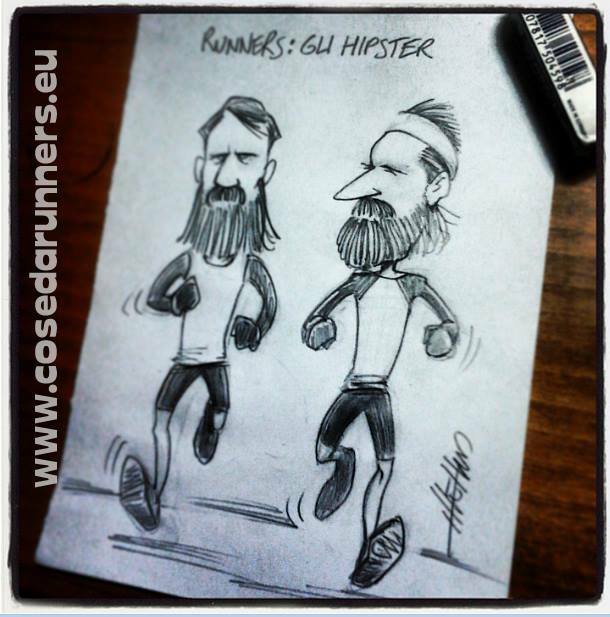 This second drawing seems to be a mix between past and present. Dolores still has the recent look of “The Voice of Ireland” while her pose reminds of us of an old picture of her. Published on August 9th. 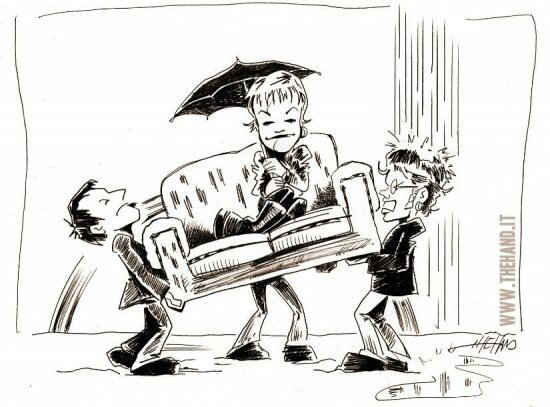 This one belongs to the old times with the whole band and the legendary sofa. Published on August 4th. Just for fun, let’s pay attention to this fourth drawing which does NOT represent any band members as it is just two “hipster” runners according to The Hand, but the look of these guys is very close to that of Noel Hogan these days, don’t you think so? Published on August 6th. 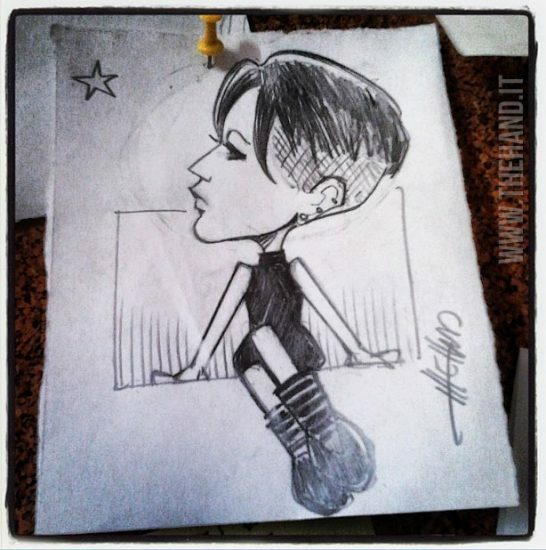 The Hand is still a very talented five star artist. 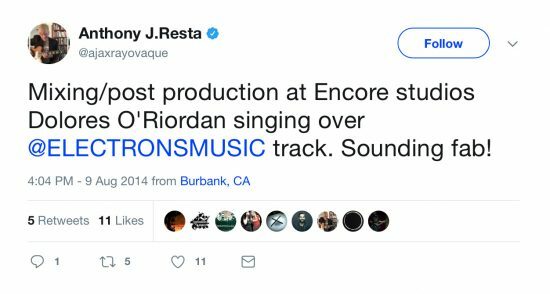 Mixing/post production at Encore studios Dolores O’Riordan singing over @ELECTRONSMUSIC track. Sounding fab! It is to be noted that ELECTRONS is one of Eric Alexandrakis’ projects along with Warren Cuccurullo, Steve Ferrone, Roger O’Donnell and Anthony J. Resta. 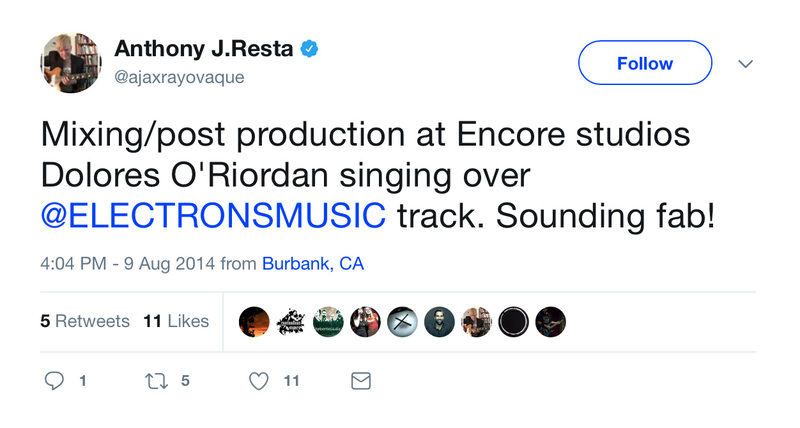 This could be one of the reasons why Dolores travelled several times to L.A. while recording “The Voice of Ireland” at the beggining of the year as this is were the Encore Studios are located. Noel Hogan published on Tumblr today an advert for the upcoming concert of “The Pigtown Fling” on September 20th at Crescent Hall in Limerick. The show will start at 8:00 PM and only 500 tickets are available! 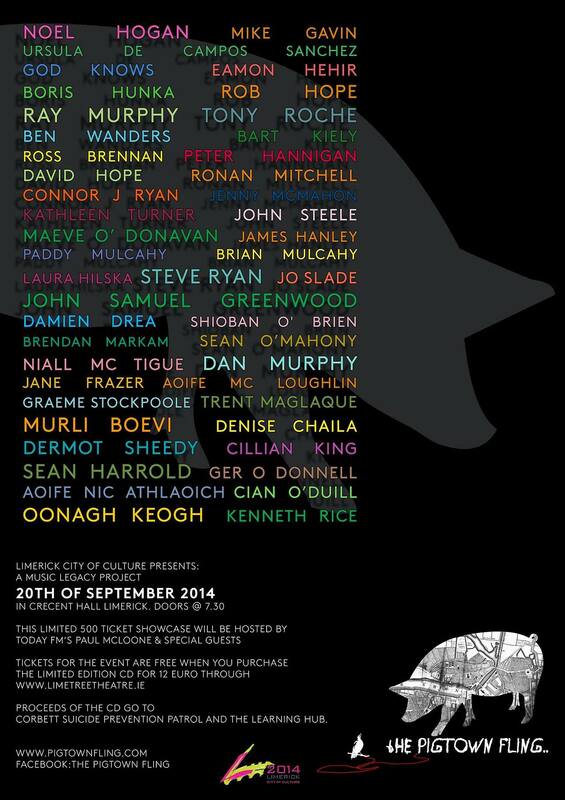 Good news, the concert/showcase is free if you purchase the limited edition CD (€12.00) via the following website: www.limetreetheatre.ie (scroll down and you’ll see the information link). If you have no idea what The Pigtown Fling project is, take a look here and here. 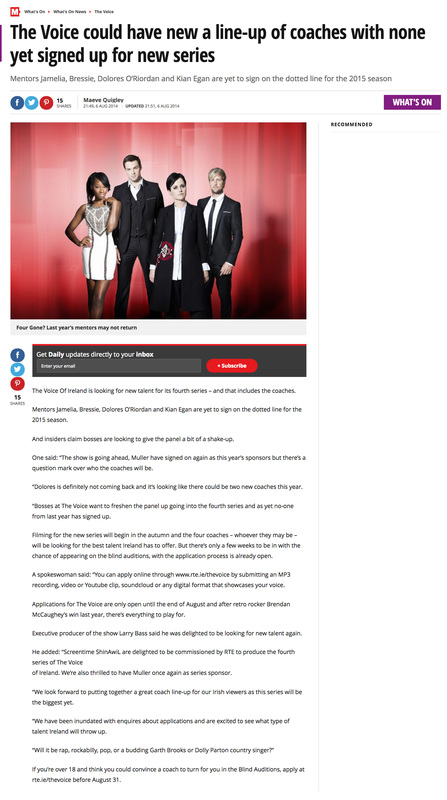 According to the article entitled “The Voice could have new a line-up of coaches with none yet signed up for new series” published by the Irish Mirror yesterday, Dolores O’ Riordan is definitely not coming back to the TV show “The Voice of Ireland”. Well, even if we already had clues about it and even if it still hasn’t been officially confirmed yet, it seems quite clear that Dolores is not returning for another season next year unless producers would like to spring a surprise… with those kind of TV shows you never know! Fanberries just added 2 great rare pictures on Facebook, thanks to him for these 2 gems! 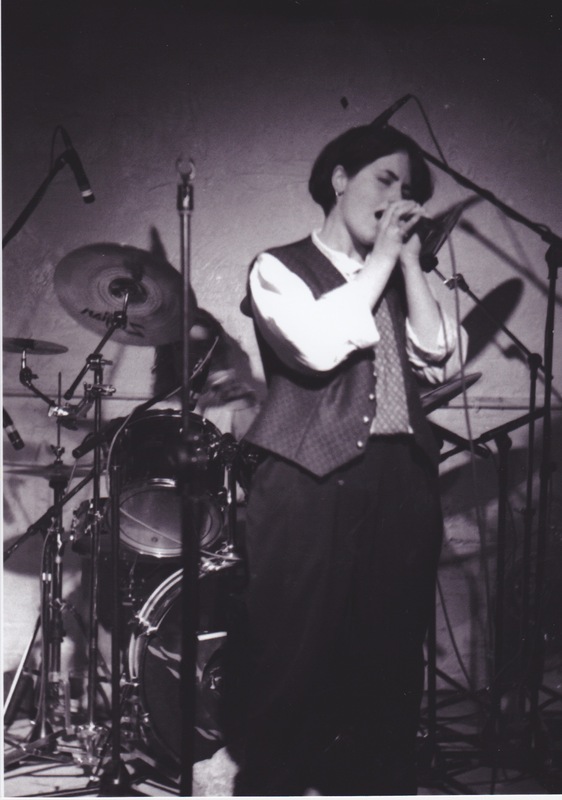 First one was taken in Cork Ireland at Sir Henry’s on June 1, 1991 and originally appeared online on Dailyedge.ie’s website inside an article about the legendary venue and some of its memorabilia. It is unclear whether this show is one of the last under the name The Cranberry Saw Us or one of the first (maybe the first) under the name The Cranberry’s. The second picture is quite recent in comparison. 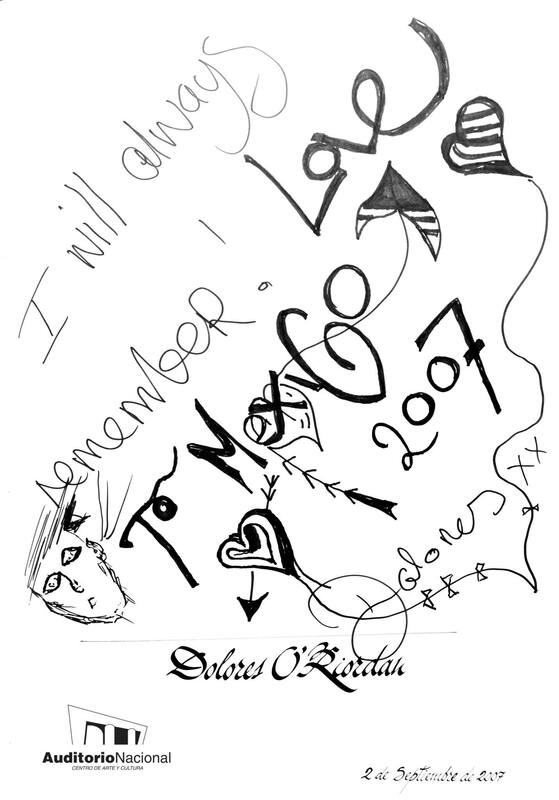 This is not really a picture as it is usually understood but one from the official guestbook of the concert’s venue (Auditorio Nacional) signed by Dolores on September 2, 2007 in Ciudad de México (Mexico City). We don’t see that kind of information too often as generally it is not supposed to be public. For example another guestbook we have here on CW comes from the very last show (to this day) of The Cranberries and is signed by all 4 band members. For those of you – and there is a lot – who are still wondering what exactly is hidden behind this weird name/project “The Pigtown Fling”, Noel Hogan and John Greenwood respectively producer and creative director of this big collaborative musical project recently recorded a small video where they clearly explain what it’s all about. If you are following Noel on Tumblr (http://noelhogan2.tumblr.com) you may have seen these last months a lot of photos of musicians working with him in studio very conscientiously. Photos were published raw without real comments or larger explanations. If you were not paying attention closely you probably just understood at best that he was doing some music for his hometown on the occasion of the Limerick 2014 city of culture. So if you recognize yourself in these last few words or if you never heard about this project at all, then this video is made for you. It’s a kind of EPK published on Vimeo by John Samuel Greenwood, creator and director of TPF project. Just focus 4 minutes and all will be clearer. The next step is a presentation of the 18 tracks live on stage on September 20, 2014 in Limerick. Thanks to Litsa for the info.